They say that being a farmer is a tough job. It’s not a career that lets you retire early and comfortably, especially in today’s unpredictable economy where the lower class workers are always the ones affected first when “change” comes along. It’s typically hard for people with agricultural labour jobs to rise from poverty and hard life – but this guy is an exception. Edwin Dela Cruz was contented with his casual work as a farmer, reaping and selling his crops to a local market in his province, Nueva Ecijia. Then in early 2011, his long-time friend reached out to him and asked to join a Facebook group called the ‘South Nueva Ecija Bonsai Lovers’. As the name suggests, the group consists of people who all have the same interest of making a bonsai. He was initially skeptical about it as a hobby, but after he saw people buying and selling their home-made bonsai and making huge profits from it, he decided to give it a try. Since he already had good knowledge about growing organic plants and crops, he decided to turn it into a business venture which turned out to be very profitable. In fact, he multiplied his profits by five times his business capital! Before starting his own business in the bonsai community, he only wanted to have one displayed in his house. He searched the markets for the most affordable bonsai only to find out that every single one was priced incredibly high. This prompted him to make his own bonsai. And through the Facebook group that his friend introduced to him, he learned the fundamental basics of creating a bonsai. Dela Cruz said that in the group, fellow bonsai enthusiasts would organise occasional trips to the local rainforests in order to save and collect runoff trunks such as bantigue, carmona, banyan and many more. These plants were later used as materials to create their pro-environment bonsai projects. “We would go to places like Aurora or General Tinio and find these materials by the side of rivers,” he said. However, some bonsai enthusiasts do not have the luxury of time to go and scavenge in the wilderness for lonely trunks. But Dela Cruz said that this never posed any problem because some sellers in the group offer the runoff trunks they collected during their patrol to them. Aside from that, they also engage in exchanging materials that are essential in making a beautiful bonsai plant. Some of these materials even come from distant provinces like Koronadal or Ilocos. According to him, some materials like Bluebell would only come from Mindanao. Meanwhile, the Dwarf Lemon, Bantigue, and Pine Tree materials usually come from Ilocos. “Some of the materials are up for sale at PHP700 to PHP900. Once you’re done crafting the tree, you can sell it for as low as Php2,000 after three months of growing it,” said Dela Cruz. He added that for a measly capital of PHP700 to 2,000, the ROI (Return of Investment) was still a good deal. As for growing and caring for a bonsai that is a year old and above, they can already be sold away after three to five months. 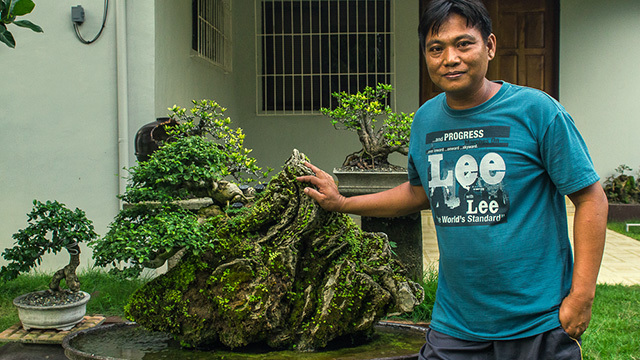 “Sometimes, for just a capital of Php500 for materials, you can sell your bonsai for Php5,000,” he said. Dela Cruz disclosed that one of the best sales he had in the business ranged from Php25,000 for a pot of bantigue that was aged for two years and above. He also said that most of his buyers prefer to buy bulk orders. During more active days, his sales would round up to almost 18 to 36 pieces a month; but in slower months, he’s lucky enough to sell more than 6 pieces. 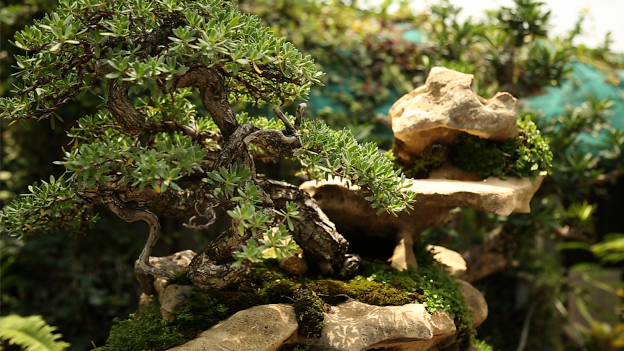 Since 2011, he has crafted and harboured over 700 different types of bonsai trees. Out of these, he sold 200 to other hobbyists. He tends to the remaining ones and add them to his growing collection. Dela Cruz added that it is important to have a support group for your hobby, and added that criticism and guidance is critical in creating a bonsai in order to avoid fatal mistakes (literally) and kill the tree. “I upload photos of my bonsai in the group. I make sure to include shots from all angles, from the base, to the trunk, to the top. I always ask them for their opinions on how I can improve it and the members always give me their honest feedback,” he said. But aside from giving advice and opinions, these Facebook groups also conduct seminars and lectures from experts who have been to multiple countries like Taiwan, Japan and other Asian countries for bonsai development. “A good bonsai maker should always strive to improve. That is why I read and try to learn new techniques. I read books, watch these lectures, and consult with fellow bonsai makers,” he said. He has also competed and won in many bonsai making competitions in the country, including the 7th Bonsai Show Competition in Nueva Ecija, where he was named the champion. “If you become known and win competitions, you can raise the price on your creations,” he added. People and bonsai enthusiasts flock to Dela Cruz for his creations, but he manages the traffic by posting his prices online for his low to mid-end creations. When it came to the prices of his high-end bonsai, he prefers to send personal messages to the potential buyers for the price list. Although he’s earning a handsome figure in his business, he doesn’t treat what he does as a “job.” To him, caring and creating bonsai from scratch is a hobby worth all of his time. “I really enjoy doing this. Seeing and taking care of them is very relaxing for me. It’s like therapy,” he said. He even makes the effort to wake up early at 5am to water his creations, go to the market, then head back to take care of his plants to make sure that everything is in top shape.